A Rheinmetall Mission Master UGV. Rheinmetall Canada has qualified 70 mm rockets on its Mission Master unmanned ground vehicle (UGV) at the Denel Overberg Test Range in the Western Cape. The vehicle received both NATO and South African National Defence Force (SANDF) qualifications after firing Thales 70 mm rockets (rockets are now qualified under NATO Standardization Agreement (STANAG) 4568 on unmanned vehicle interoperability). Such a capability was demonstrated to hundreds of guests at the recent Rheinmetall Denel Munition (RDM) Ammunition Capability Demonstration between 18 and 21 March. Rheinmetall said the Mission Master project started 23 months ago using an off-the-shelf Canadian all-terrain platform to speed up development. This was converted to electric drive – the lithium-ion battery can be fully charged in three to four hours but an auxiliary power unit can be carried which gives it an endurance of seven days. With a 600 kg payload, this can drive for 200 km. It can tow a two ton load and has a speed of 30 km/h. The UGV is controlled by a single soldier through an electronic device. At the Ammunition Capability Demonstration, the vehicle fired a salvo of 14 70 mm Thales rockets, which delivered 60 kg of explosives. The Mission Master – Protection vehicle is equipped with both Rheinmetall Fieldranger Multi weapon station and a 70mm rocket launcher from Thales. In direct fire mode, the Mission Master’s rockets have a range of 2 km, while range increases to 7 km for indirect fire. Guided rockets can be fired out to 9 km. 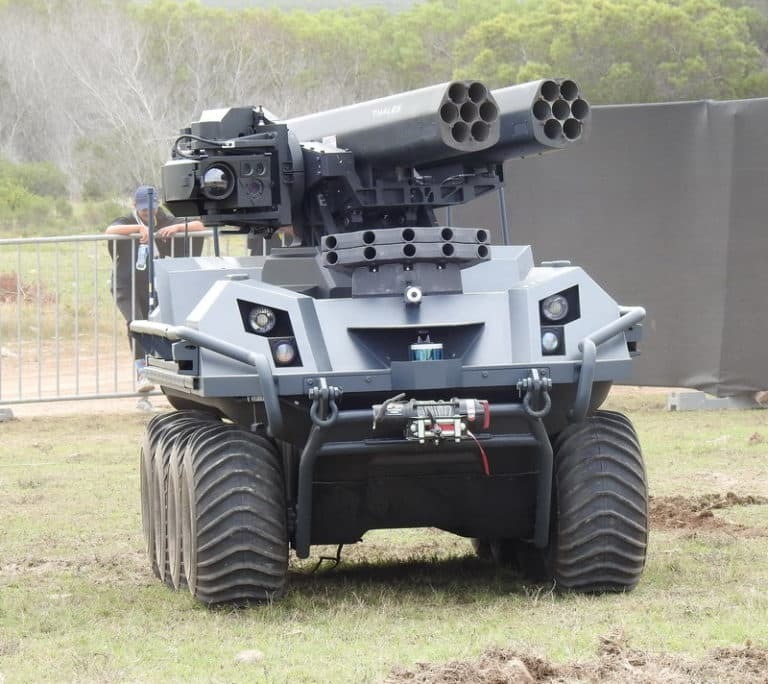 Apart from rockets, the platform has been tested with a 12.7 mmm machinegun and can be fitted with a 20 mm high velocity cannon, 40 mm grenade launcher or Spike Missiles. At the Denel Overberg Test Range, Rheinmetall also unveiled a new version of the vehicle, the Mission Master – Rescue. This new variant delivers the ability to evacuate injured people over long distances, independently. The module showcased two basket stretchers with sliding provisions and the complete medical accessories needed for field intervention. The Mission Master is 2.95 metres long, 1.55 metres wide and weighs 750 kg. While the standard version is an 8×8, tracks can also be fitted. Numerous variants are available, including the Mission Master – S with a three metre telescopic surveillance mast with infrared and CCD cameras as well as a rangefinder, and Mission Master – CR (communications relay). Other variants include CBRN for the detection of chemical, biological, radiological and nuclear threats, and firefighting.